I had to do the tax return on Monday. But one look at the weather and I decided that Wayne Swan would have to wait another few days. Fishing conditions were perfect. 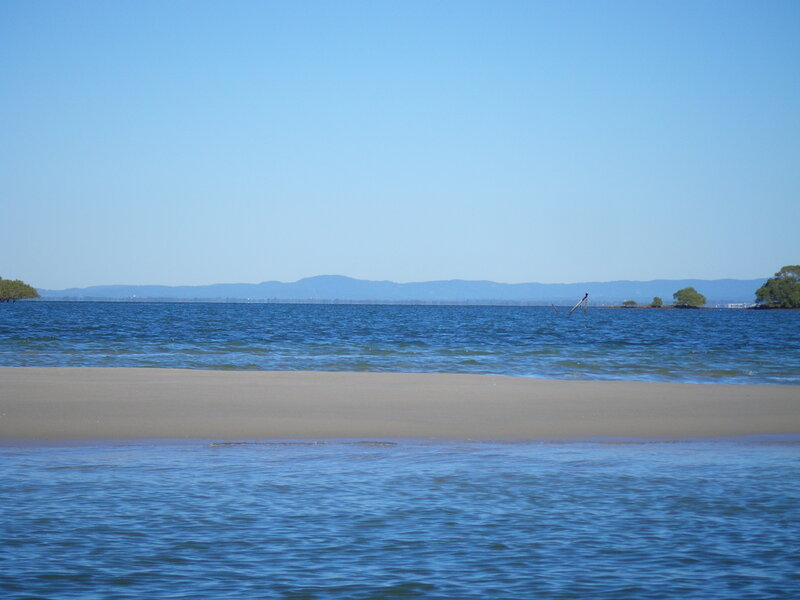 I could not start early so I arrived at the Bribie Bridge just after 8.30am. It was just after high tide. There was no real wind and the new moon was due on Tuesday. The water was very clear despite the recent high winds. I got straight down to business with a GULP 4” Minnow in the Smelt colour, on a 1/8th 1/0 jig head. I was using my light spin rod and had it loaded with 8lb braid and a 12lb fluorocarbon leader. I waded out to the north of the bridge, on the mainland side. The Flathead come right up to the edge of the mangroves on a high tide and this was what I was looking for. It was a 1.8 m high tide which is a fairly ‘low’ high tide for this area. I waded out a bit further on the north side of the bridge to cast at the rocky area, just in front of the third set of bridge legs. The lure bumped on a few rocks and then the line went tight and started wiggling. It was a 44cm Flathead and my first decent fish for a while. I moved south towards the oyster jetty. The tide was just starting to run out. I cast all around the rocky reef just south of the bridge, with no luck. As I got a bit closer to the jetty I felt a solid bite. I paused, counted to ten, then struck. 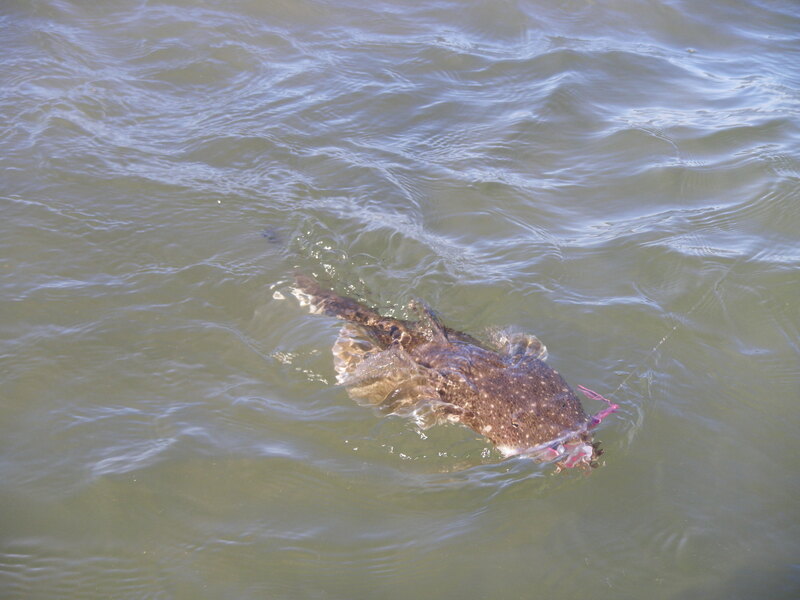 This one was a bigger Flathead – just under 50 cm. 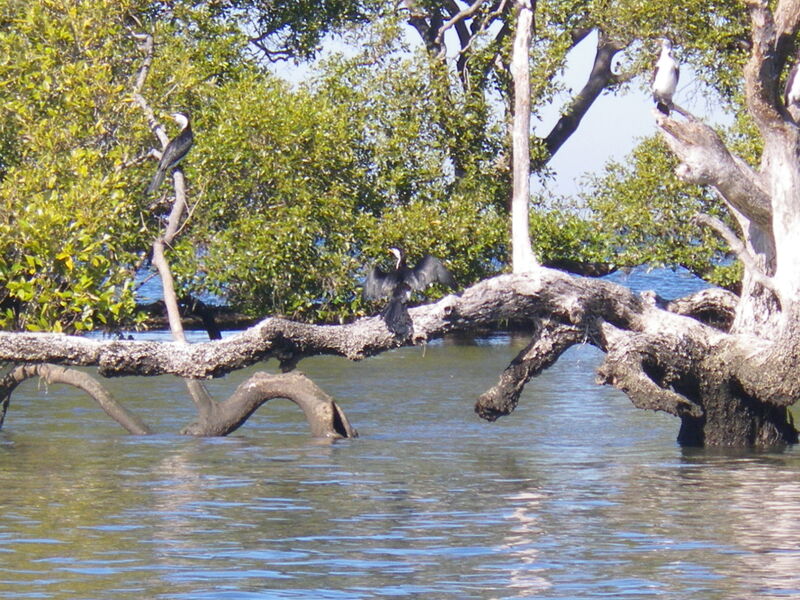 It tried a few headshakes, as I waded up into the shallows, but I soon had it landed by the mangroves. I moved under the oyster jetty and continued to cast out into the Passage. I was casting into the run out tide and working my lure back along the bottom with the flow. I felt a good bite and cast back in the same spot. This time I saw the Flathead follow the plastic but it turned away at the last minute. I kept casting at the same spot and felt another bite, but I just could not hook it. I swapped soft plastics to a GULP 5” Jerkshad in the Cajun Chicken colour. I moved further south, over the sand flats towards the green channel markers. At about 10.30 am I felt a solid hit and the line started peeling. This was a bigger fish and it had grabbed the lure on the drop, so it was a long way away from me. The tide was running out but there was still no nearby sand bank to land the fish on. I decided to play it out and try and grab it – this usually ends in tears – with me getting a quick spike and then dropping the fish. This time, I let the fish make lots of runs and then maneuvered my keeper bag, like a landing net, under the fish. I shortened the line and pulled the fish into the bag. I then took out the hook in the bag. This was the best fish of the day at just under 60cm. 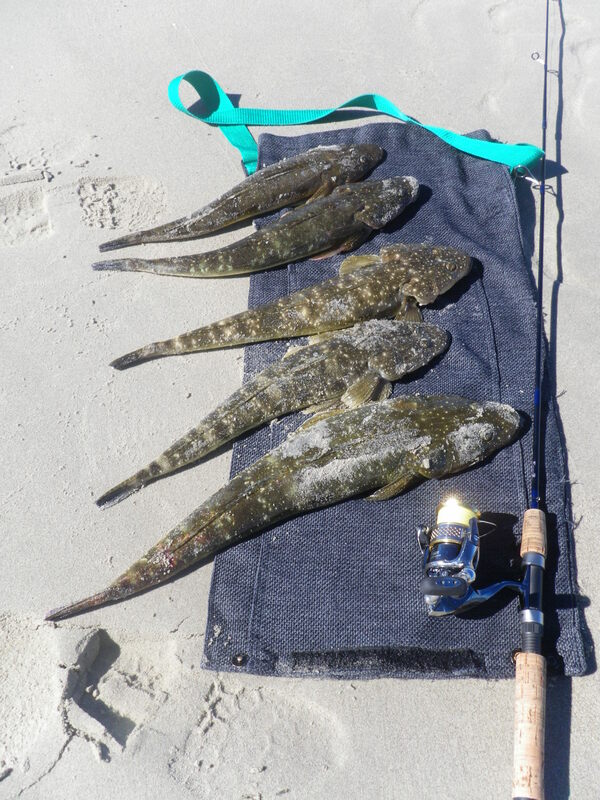 I continued wading across the flats and soon caught two more Flathead on the same soft plastic, about 50cm long. With a full bag it was now catch and release for the rest of the day. 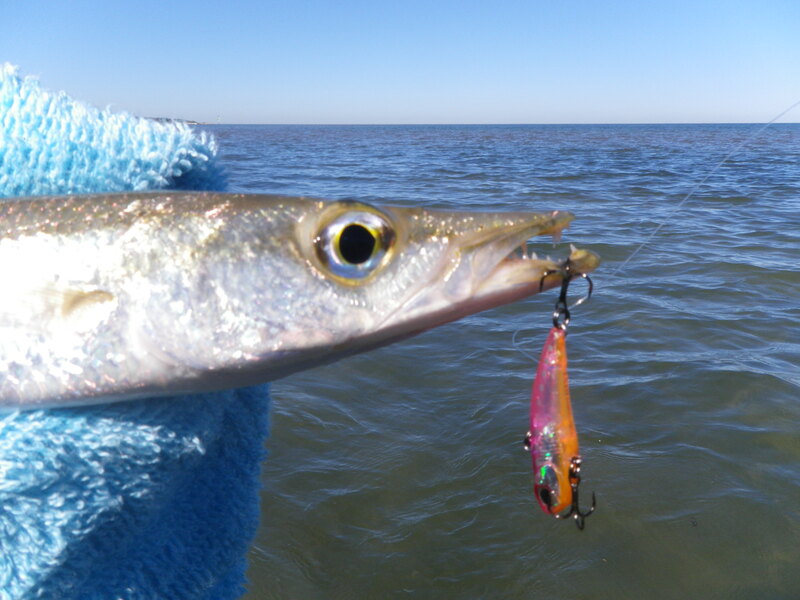 I had reached a sandy patch by the green channel marker and decided to try the DUO Tetraworks Bivi small hard body vibe lure. After a couple of casts I found some Pike. The lure may have worked on the Flathead but the problem was getting passed the Pike. I caught seven Pike in ten casts and realized that I was not going to beat them. I swapped back to a GULP Jerkshad – this time in the Satay Chicken colour. The Pike left this alone so I turned around and started to wade back in the direction of the old oyster jetty. At the edge of the weed banks I found the Flathead again. I caught another six on the way back to the bridge – all were legal size, from about 50 to 60 cm. They all went back for someone else to catch. The weather was perfect and the fishing matched the weather – shame about the tax return! 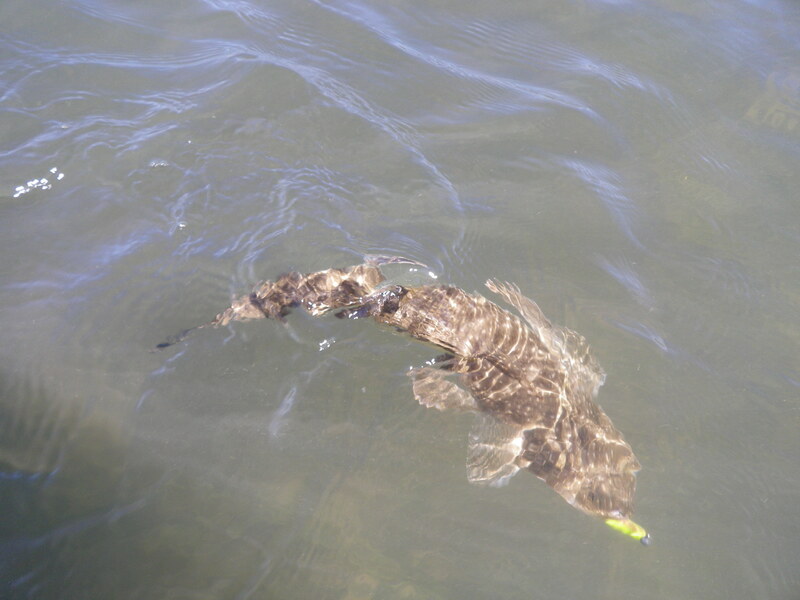 This entry was posted in Bribie Island, Fishing Reports and tagged Bribie Island, catching flathead on soft plastic lures, fishing Bribie Island, fishing Gulp soft plastics, jerkshad, jighead, land based, land based fishing, Queensland. Bookmark the permalink. See you dont have to do all the travelling to catch decent fish good job mate but you didnt pop in for a visit. Had the coffee ready for ya.